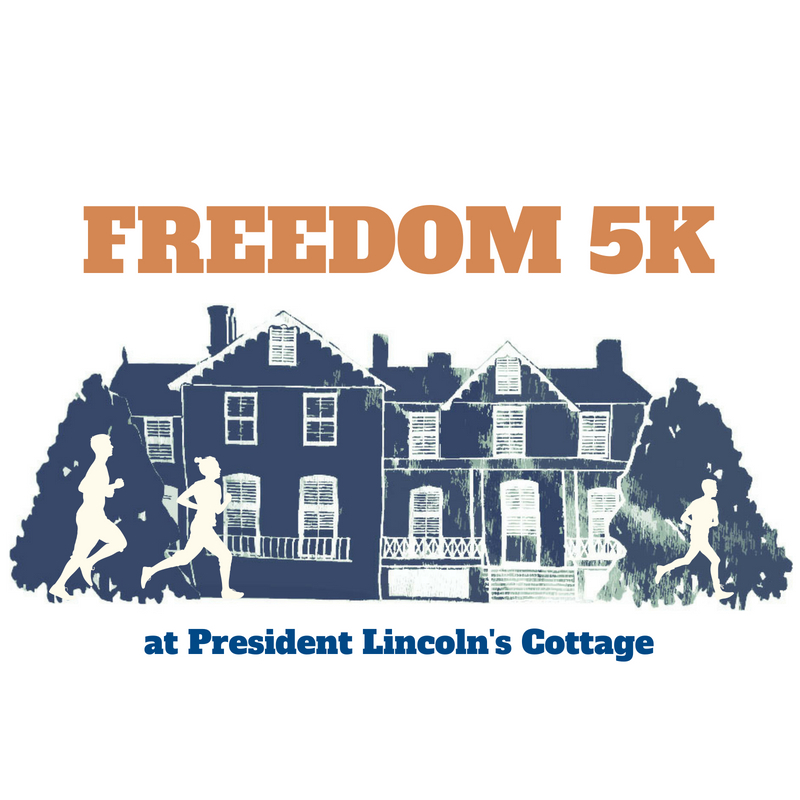 Run for freedom at the fifth annual Freedom 5k on September 22, 2018, at President Lincoln’s Cottage, where Abraham Lincoln contemplated freedom, justice, and equality while in residence and issued the Emancipation Proclamation, his nation-changing executive order. September 22 marks the exact anniversary of President Abraham Lincoln announcing his decision to his Cabinet to issue the preliminary Emancipation Proclamation. Traverse a pastoral landscape that winds past ponds, fields, historic buildings, and vistas on this breath-taking course. The run culminates on the foot of the lawn at President Lincoln’s Cottage, where a ceremony will take place. The annual Freedom 5K is an exclusive opportunity for members of the public to race through the 250-acre grounds of the Armed Forces Retirement Home – home to hundreds of veterans– in Northwest Washington, DC. Proceeds and donations from the run support the mission of President Lincoln’s Cottage, a private non-profit organization. The race starts at 9 am. Continuing with our new tradition, we’re combining our two popular events, the Freedom 5K and Family Day, into one full day of racing and family fun: Homecoming. During the Civil War the Lincoln family called the Cottage home. This year we welcome everyone back “home” to join us for a full day of activities where you can run, walk, and play like Lincoln. Come for just the race, just Family Day activities, or stick around for both! Please note, you must register for the Freedom 5K. All Family Day activities are free, but we still ask you register for a head count. The Family Day festivities begin immediately following the Tot Dash and conclude at 3 pm. Visit www.lincolncottage.org for more information on Lincoln’s Cottage and the property. Registration fee: $35 until online registration closes on September 20 at 8:00 pm, then will be $40 through race day. Tot Dash: 100-yard Tot Dash for FREE following the 5k race. Register the morning of the race. 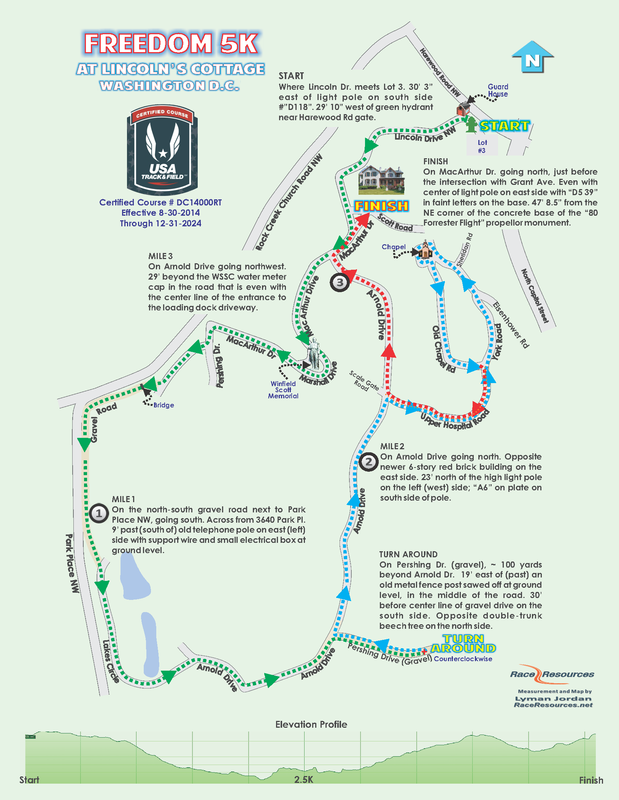 Packet pickup: Packet Pickup will be held on Friday, September 21, from 4:30-7:30 pm at President Lincoln’s Cottage and Saturday, September 22 starting at 7:30 am. Parking: Limited parking space is available for a $5 fee per vehicle. The number of total vehicles is restricted to 100, so parking passes will be sold on a first-come, first-serve basis. Passes will be distributed during packet pickup on Friday, September 21. If you paid for a parking pass but are not able to make it to packet pickup on Friday, September 21, you can pick up your paid parking pass at the front gate on Saturday morning. Public Transportation: Because onsite parking is limited to the first 100 who purchase a parking pass on-line, it is highly suggested you take public transportation to the event. There will be a bag drop available on site. · METRO RAIL: The Georgia Avenue/Petworth Metro Station (Green & Yellow Lines) is 0.8 miles downhill from Eagle Gate and is the closest metro station to President Lincoln’s Cottage. The station is located at the intersection of Georgia Avenue, New Hampshire Avenue, and Rock Creek Church Road, NW. From the Metro exit, walk south toward Rock Creek Church Road, and then turn left onto Rock Creek Church Road and continue along it for approximately 0.8 miles. Turn right into the gates at the intersection of Upshur Street and Rock Creek Church Road. Alternatively, catch the H8 bus (see below) from a stop at the intersection of New Hampshire and Georgia Avenue, just south of the Metro exit. · METRO BUS: The H8 Metro Bus stops at “Rock Creek Church Rd NW and Upshur Street NW” (stop # 1002986) immediately in front of the Eagle Gate entrance. After exiting the bus, the gate will be on the right-hand side of the road. You may also take the 60 Metro Bus to the stop at Upshur Street and 2nd Street, NW. From there, walk east on Upshur Street towards the Eagle Gate entrance. TIP: Most bus and rail employees are not familiar with specific tourist attractions along their routes. They will need to know the line, route, and stop you are looking for in order to assist you rather than the name of the site. When in doubt, contact our staff for support (202)-829-0436. Location: President Lincoln’s Cottage is located on the Armed Forces Retirement Home (AFRH) campus in Northwest Washington, D.C. We are located on Federal property and all Freedom 5k attendees must bring a photo ID to be checked at the security gate. For Additional Information or questions contact President Lincoln's Cottage at 202-829-0436 or Freedom5k@lincolncottage.org.